Kelise Franclemont, ‘Salat ul-Istisqa’a [Prayer for Rain]’, 2017, copper, acrylic, and sound, in ‘Water Stations’ at Emmanuel Church, West Hampstead, London. Image courtesy the artist. When water is scarce, an ancient Bedouin tradition calls the faithful to beseech God for healing rains. This Islamic ritual is known as “Salat ul-Istisqa’a”, rising to heaven one drop at a time. “Salat ul-Istisqa’a [Prayer for Rain]” is a response to the number of documentaries from 2013-2016 about the irreversible water crisis in Gaza. 2020 is rapidly approaching, the year when experts fear that the fresh water supply in the region’s underground aquifers will be damaged beyond repair. Even now, experts fear the worst has already happened as ordinary people who live, work, and raise families within view of the Mediterranean, are dying of thirst. 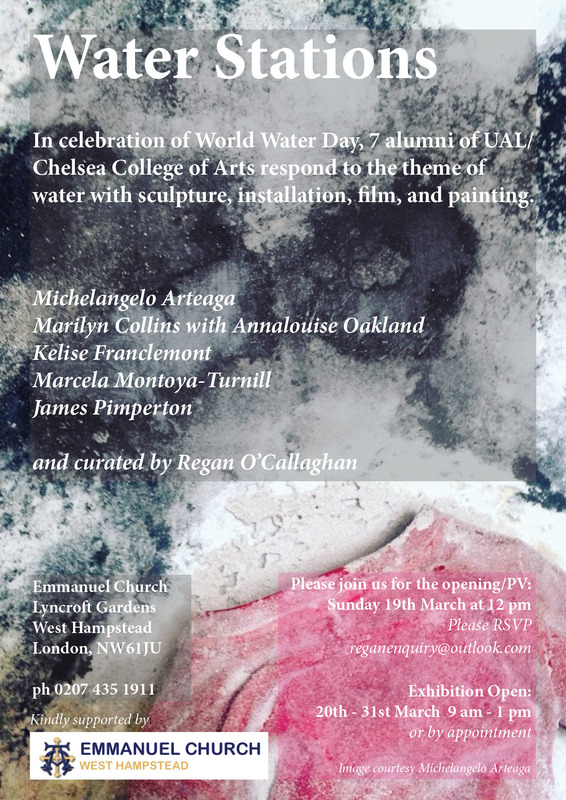 “Salat ul-Istisqa’a [Prayer for Rain]” is part of “Water Stations” an exhibition in which seven artists convene to honour World Water Day with sculpture, installation, film, and painting, at Emmanuel Church in West Hampstead from 19th through 31st March 2017. Posted in exhibitions, installation, site-specificTagged collaboration, interactive art, Palestine, site-specific installation, storytelling in art, video artBookmark the permalink.